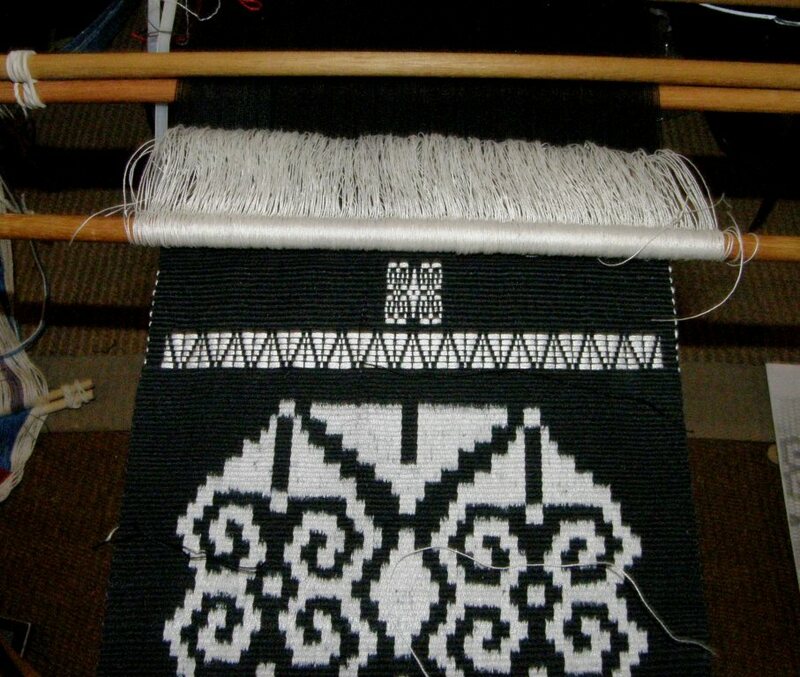 The simplest form of set-up on a backstrap loom is one that is based on the basic warp cross and which enables the weaver to create two sheds. Yarn is wound around stakes in a figure-eight path. Two beams/sticks/ rods are placed within the warp to replace the warping stakes. One beam is attached to a fixed object which could be a tree, a railing, a heavy piece of furntiture or a stake driven into the ground. The other end is attached to the weaver’s body by way of a strap that passes around the weaver’s hips. Heddles are applied to the warp ends on one side of the cross to enable the weaver to lift one half of the warp threads and create a shed. A stick, which I call the shed rod, is placed to allow the weaver access to the other half of the warps. The blue object in the above picture represents a sword placed within the shed. 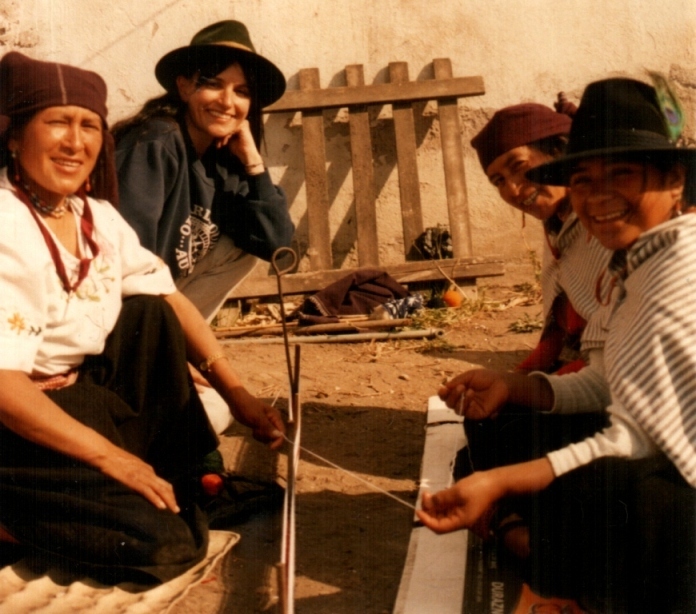 Above, you can see Montagnard weaver, Ju Nie, raising the heddled warps to create one of the two sheds on her simple circular warp. And here, you can see her sword placed within the shed created from the threads held on her bamboo shed rod. It’s a beautifully simple set-up for creating warp-faced plain weave. One of my Guatemalan teachers used the terms “crossed” and uncrossed” to distinguish the two sheds possibly to simplify things even further for gringa teaching! You can clearly see the crossed form of the warp and the uncrossed one in the two pictures above. 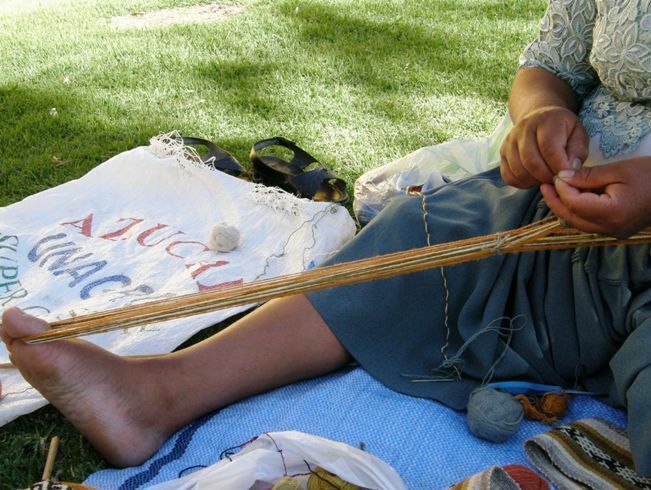 Maxima, Cochabamba, Bolivia making heddles. How do weavers place and secure their stakes for warping? Do they create circular or single-plane warps? How do they secure the cross? Do they add heddles while they warp or after? How do they make the heddles and what material do they use for them? What do they use to hold the warps in the other shed? And, how do they operate the sheds? And this is all before I can even see what kind of cloth they produce with these simple looms. Yes, it’s simple but that doesn’t mean that the same methods are used everywhere. It can be oh, so very different and there is no single correct way of doing things. My way of doing things is an ever changing mixture of all the wonderful techniques that I have experienced and seen. Right now I am using what I call my “current favorite” way of setting up and operating the loom. This could change at any time when I am shown something new that I want to try. And that is why I was so excited about the backstrap looms in use in Taiwan by the Atayal people that I showed last week. I haven’t yet been able to find out a great deal about the cloth they produce and am busily collecting information and images.. In the meantime, I can simply enjoy seeing the looms and the weavers at work operating them. I love everything about this Atayal loom (picture by John G Kreifeldt), the way it has been set up and the way it is operated. And, while I am not rushing out to have one of those tipping boxes made for me, I am very much in love with that shed rod. Shed rods can come in a variety of forms. Some weavers like theirs to be of very large girth. The problem is finding a piece of wood that can be that thick without being very heavy. A common solution these days is to use pvc pipe as it rovides the girth without the weight. Of course, bamboo does the job beautifully. I have some thick rods from Guatemala made from a wood that must be extremely porous. They are surprisingly light for their size. The thicker the shed rod, the easier it is to raise those warp threads and have them clear through the heddles to the front of the loom. A lot of weavers will simply draw the shed rod down to the heddles. If the yarn is smooth and friendly, that alone will cause the threads to pass through the heddles. If using sticky yarn, like handspun wool, the weaver will need to strum the warps to encourage them to separate and clear. Sometimes a lot of strumming is needed. I have watched weavers strum away on wool threads on wide warps for quite some time before the threads will release their hairy grip on each other. The thicker the shed rod, the more work you have to put into opening the heddle shed. I am not a big fan of large shed rods. In fact,mine are often quite thin. I prefer to place my sword under the warps and use the size of the sword rather than the size of the shed rod to clear the threads through the heddles. 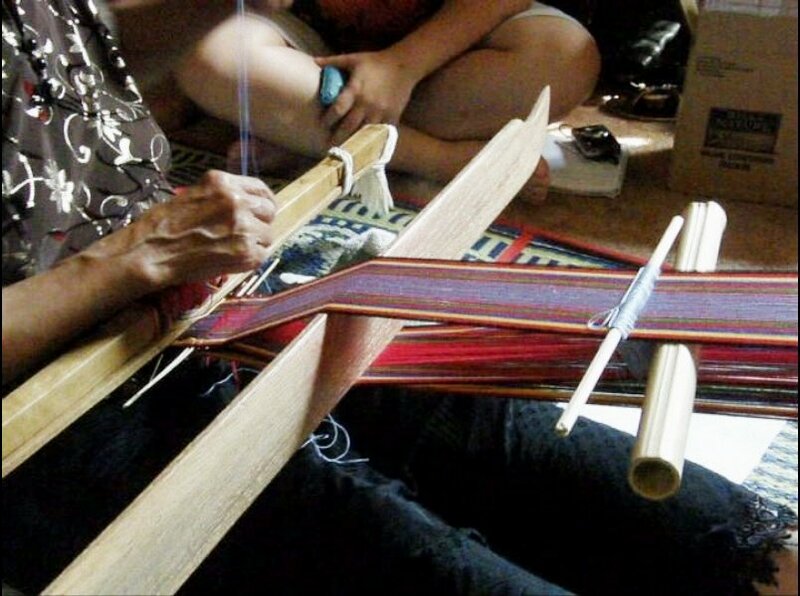 The Atayal shed rod is cool becuase of the extra stick that is slotted into it which sits on top of the warp. 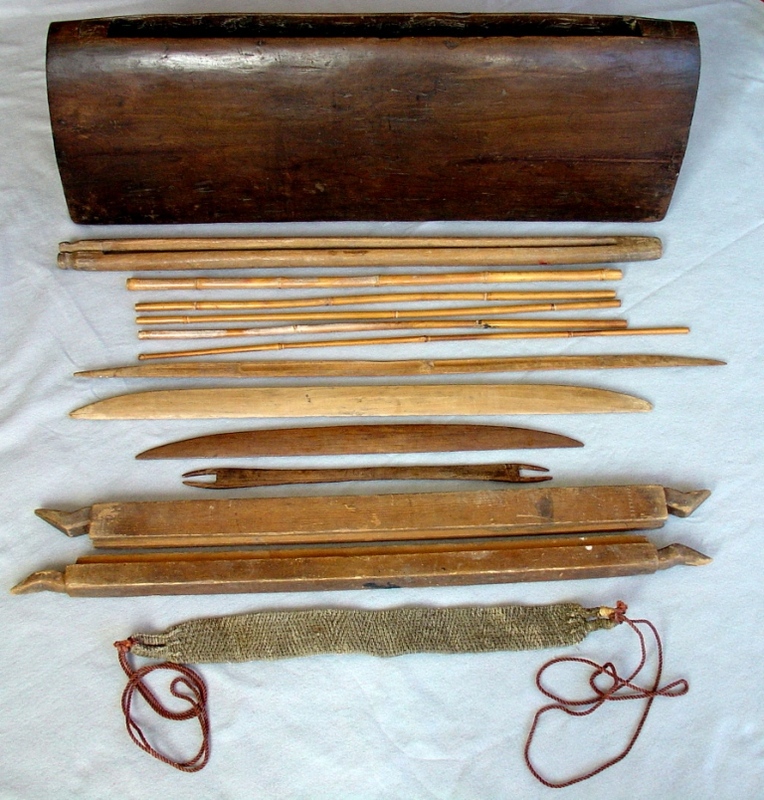 Here’s another kind in this picture of the various Atayal loom parts taken by John G Kreifeldt. The shed rod is the one closest to the box. The stick splits into two. One part would sit within the warp while the other rested on top. The weaver uses these kinds of shed rods to help raise the heddles. 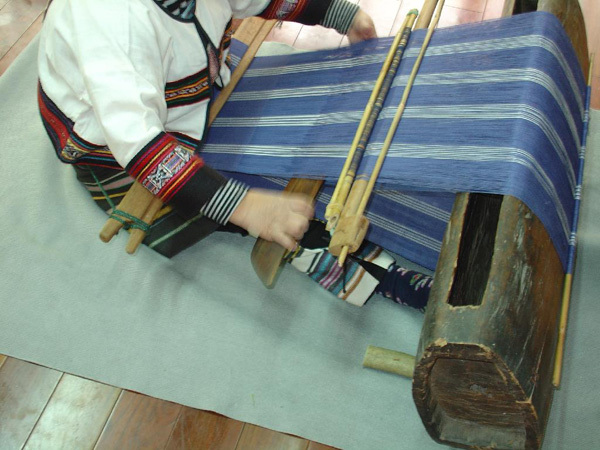 The rod is grasped and twisted away while the body moves to relax tension on the warp and the heddle rod is pulled up. If you watched the video I embedded in last week’s post, you would have seen this in action. 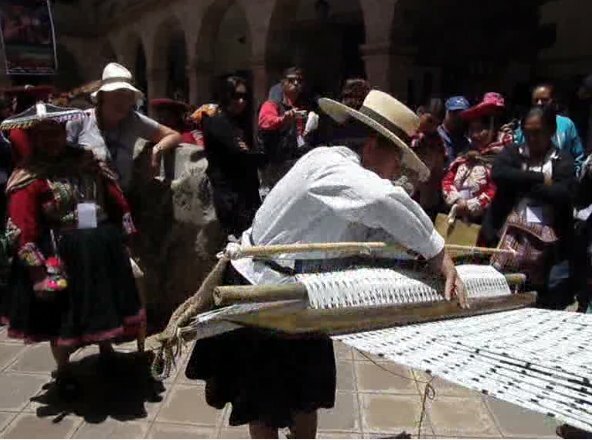 In the following picture of a weaver in Peru, you can see the forked stick that she has in her warp that acts in the same way as the two dowels in mine in the video. 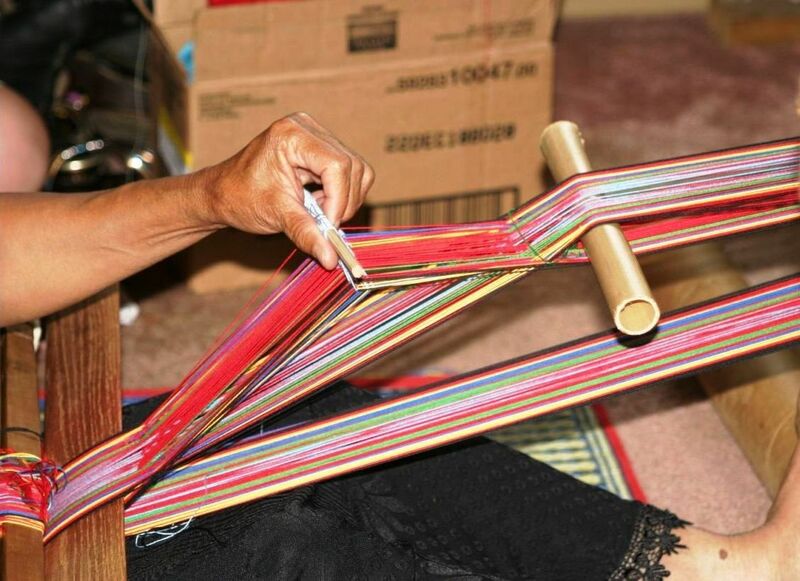 See how she twists the forked sticks, leans forward to take tension off the warp (see how slack the threads are behind the forked stick) and pulls up on her heddle rod. Now, if you can’t be bothered setting up that second cross for placing a second stick, (although, it’s really very easy and I have an FAQ on it here on the blog) you can just attach a second stick to your shed rod and have it sitting on top of the warp just as the Atayal weaver has. I tried it on my current ikat warp and it works every bit as well. It is just a little bit less stable and that is just something that I had to get used to. There are ugly rubber bands and my set-up is nowhere near as pretty as the Atayal one, but, hey, it works. It also means that my shed rod is free to move and I can slide it up and down the warp if I want to better clear the space into which I insert the sword. 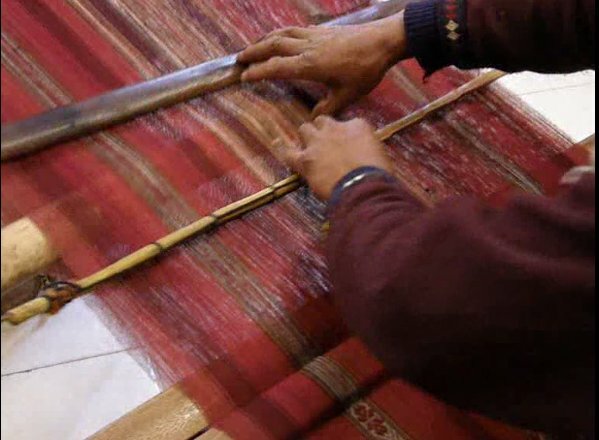 Some weavers, rather than having a second stick in or on top of the warp, have a separate stick which they pick up and apply only when they want to open the heddles. Ju Nie, for example, uses a bamboo slat. She places it on top of the warp and then grasps it and the shed rod in one hand and twists. When not in use, it just sits on the floor her side. 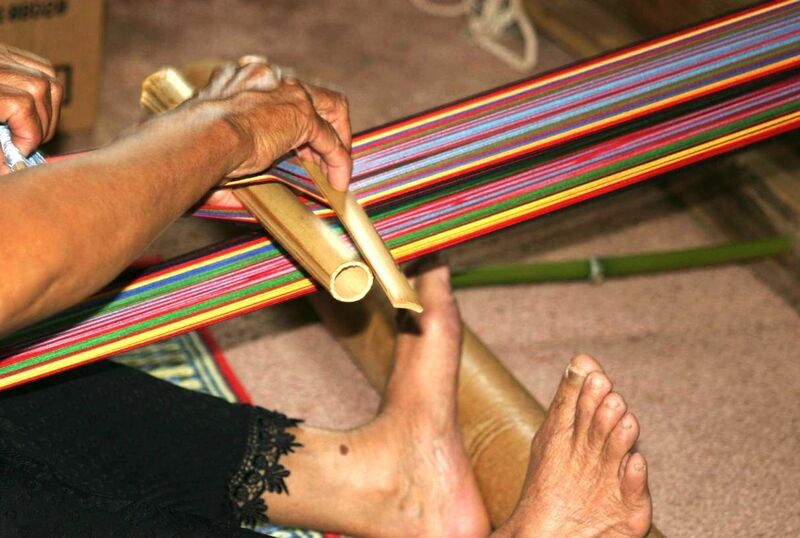 Other weavers simply use their sword as their second stick. Ju Nie’s sword is so incredibly large and long that it would be too awkward to use on a narrow warp like this one. The following pictures are shots that I captured from videos that I have taken and are blurry as a result. 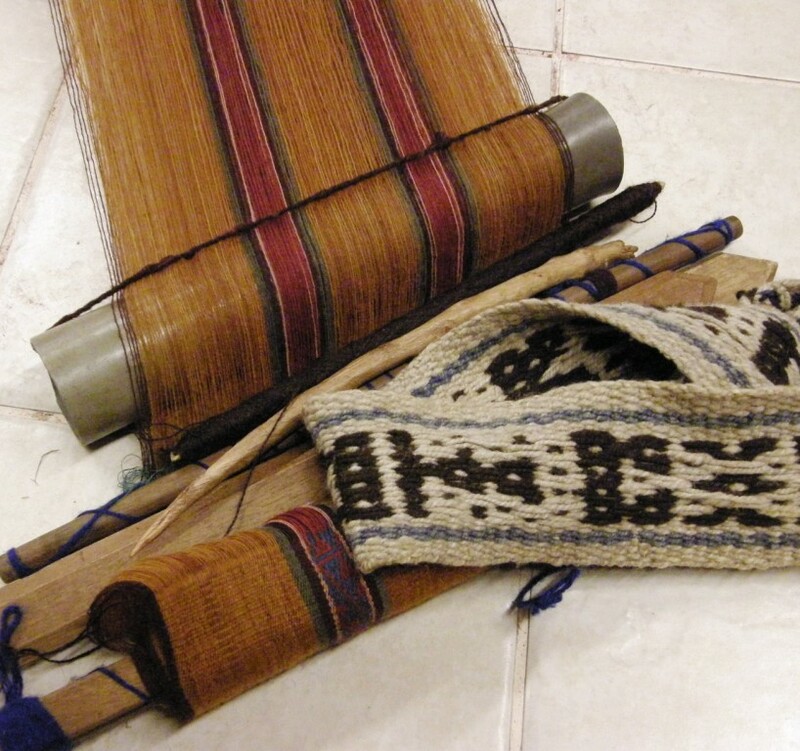 This weaver from Pitumarca, Peru has placed her enormous sword on top of the warp behind the shed rod. She is grasping both and will roll them while she pulls up on the hedde rod. Taking a few steps forward helps her relax tension. She is using a very smooth warp of fine industrially spun cotton. 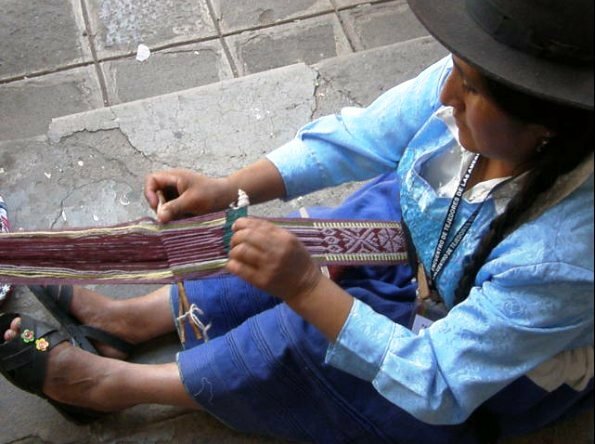 This weaver from the Cusco region is about to do the same. She had to get right up on her knees in order to relax tension while she did this. It is a sticky wool warp. You should have seen the strumming that went on to get the warps to separate in the other shed. 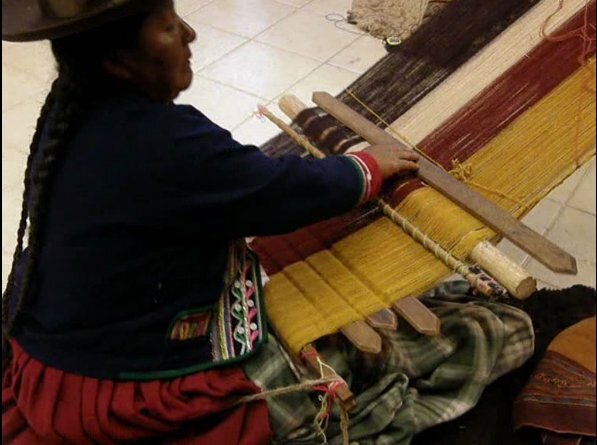 This weaver from Chahuaytire in the Cusco region is using a fine aplaca warp. He has moved his sword back beyond the shed rod and is about the grasp the two. With his other hand he will pull up on the heddle rod. 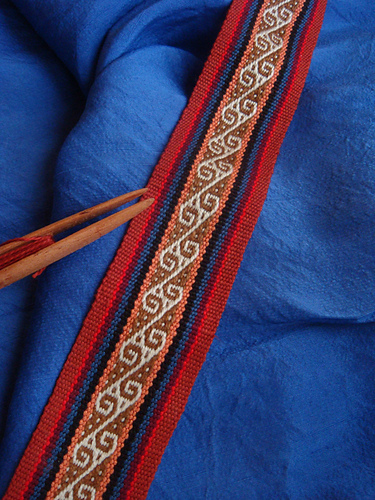 He is seated in a chair to weave and stands up to relax tension on the warp. So, what is the idea behind twisting/rolling these two sticks? What exactly is happening? The following pictures, once again, are shots captured from a demo video I made and are, therefore, quite blurry…I think you can see what’s going on. This warp is way too narrow to be bothering with a shed rod. Normally I would use a simple shed loop on a warp like this but have used sticks just for the sake of the demonstration. In the warp above, the blue threads are controlled by the string heddles and the white ones are held on the shed rod. I have a second stick placed within a second cross and that and the shed rod have been connected with rubber bands. I have grasped both sticks and am rolling them away. You can see that this action tightens the layer of white warps while the blue ones, (the ones I am attempting to raise via the heddles) behind the shed rod have become slack. My legs are straight in this picture as I have not yet moved forward to relax tension on the warp. Now a knee is bent as I come forward. Look how slack the blue threads are now while the white ones remain taut. This is what will enable me to pull straright up on the heddles and raise the blue threads creating a nice big shed. As I pointed out before, there are many methods that backstrap weavers use to operate their looms and this is just one of them. It is good to have many techniques up one’s sleeve to use in different situations. Often the stickiness of the warp threads will determine the method I choose to use. I am grateful for having had the chance to weave with, observe, and learn from backstrap weavers from many regions and countries and try out their various methods. I get very excited about all these details. I hope I haven’t bored you all with this! I am not sure how many people share my enthusiasm for these kinds of things! 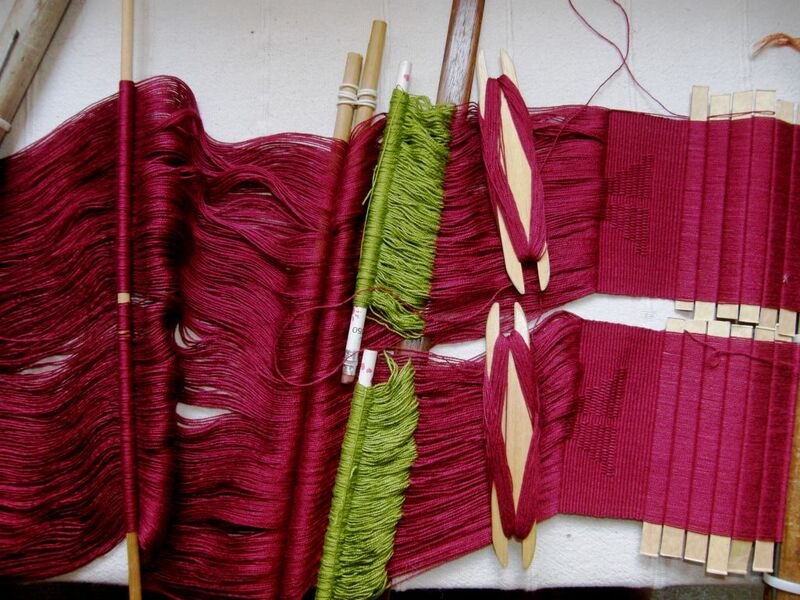 Here’s what I have been weaving this week… These are the two red panels that will accompany the black and white ikat and brocade panel I have been working on lately. I have just started a simple warp-float pattern on it and am using two sweet shuttles that Father Kyriakos made and gave me when I was in Australia. Yes, I have gone back to using a shed rod and a second stick in a second cross. Whether I keep the ikat panel or start over will be decided when I get back from my fall trip with a new supply of black dye. I wove the seven tabs last week and will show you those once all the messy stray weft ends have been put away. How looms operate to me is VERY fascinating, so no boredom here. Learned a lot from this awesome post. I knew you would like it, Kristin. I know that you another tool-lover! 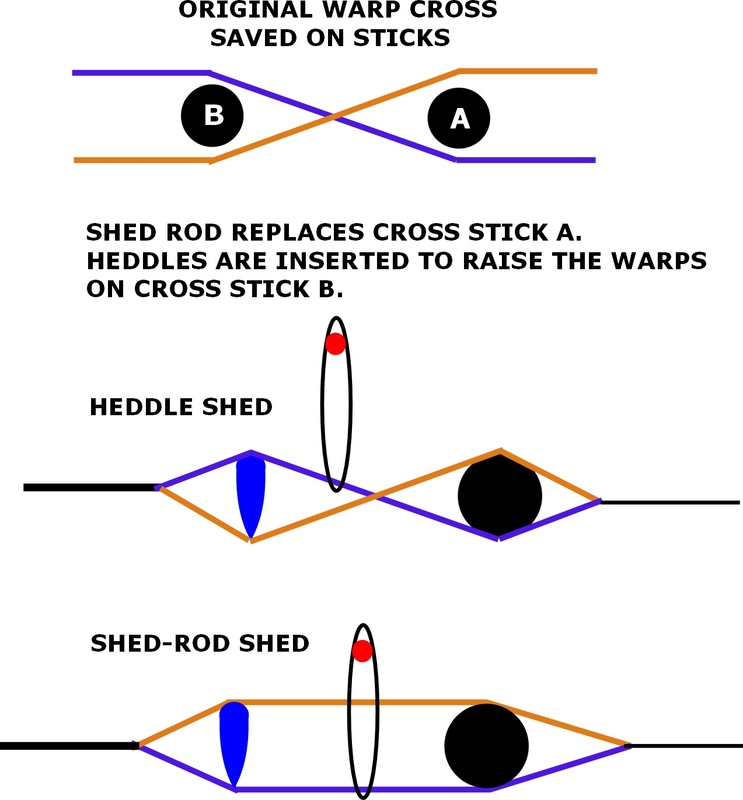 I was trying to understand the purpose of shed rods, and this greatly helped! I’ll have to study the situation more to understand how to install one.